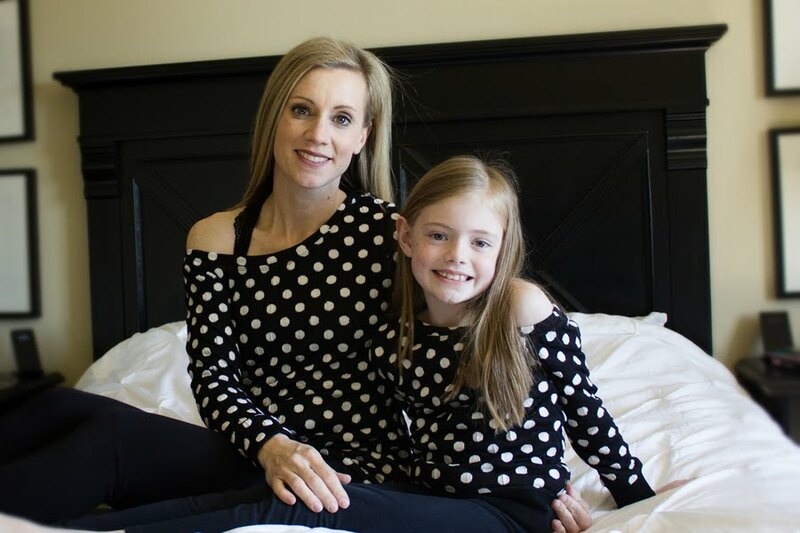 Family Ever After has a sewing competition currently going on called Sew-vivor. The contestants' first challenge was to sew something emerald. I decided it would be fun to sew along. 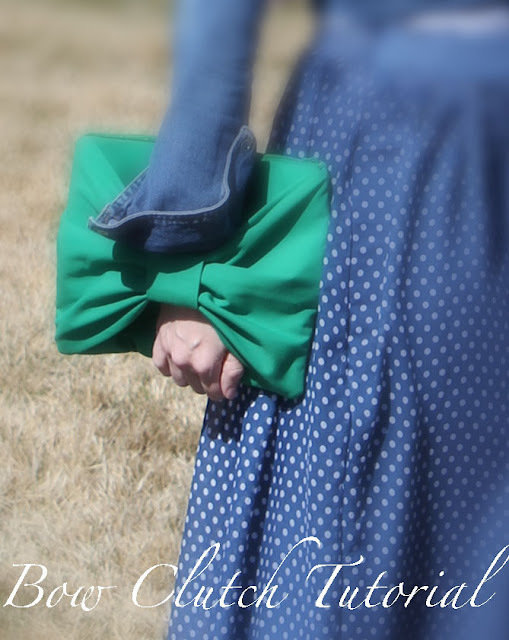 Here is a bow clutch created from green broadcloth. This clutch was quick and easy...enjoy! Steps 1-4: Cut your fabric. You will need two rectangles (12" x 9") from your outer fabric. One large rectangle (18" x 13") from your outer fabric. One small rectangle (5" x 5") from your outer fabric. Two rectagles (12" x 9") from your lining fabric. Two rectangles (12" x 9") from stiff sew-in interfacing. One zipper (12 inches). Take your 2 sew-in interfacing pieces and place them on the back side of your 2 outer rectangles. Sew around the edge using a 1/4 inch seam. Place those to the side and take your large outer rectangle (18 x 13) and fold in half width wise, right sides together. Pin and sew the short ends (13 " sides) together using a 1/2 inch seam allowance. Steps 5-8: After sewing, center the seam to run down the center in the back. Press the seam open (not pictured). Turn right side out and press again. Take your small rectangle and fold it in half, right sides together and stitch one side using a 1/4 inch seam. Steps 9-12: Center the seam and press open (not pictured). Turn right side out and press again making sure the seam runs down the center of the back. Now take your large rectangle and scrunch it together in the center to create the bow. Wrap your small rectangle around the bow. (Make sure your seams are hidden running down the back). Steps 13-16: Wrap the small rectangle around and sew using a 1/4 inch seam allowance to hold together. (You could hand stitch this too for a nicer, clean finish). Then take your bow and place it on one of your outer (12 x 9) rectangles with the interfacing on the back. Pin the bow along the sides (Stretching out the bow to fit). You can adjust this as needed. You can see in the last photo above my bow is a little loose when lining up the edges, you could pull the bow tighter and trim the ends to match if you prefer. 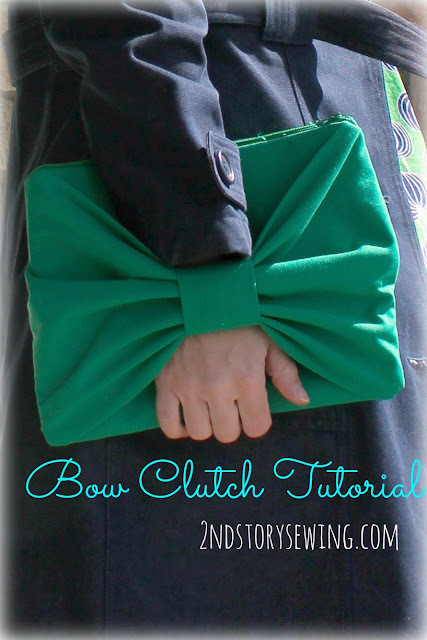 Stitch the bow to the rectangle using a 1/4 inch seam. 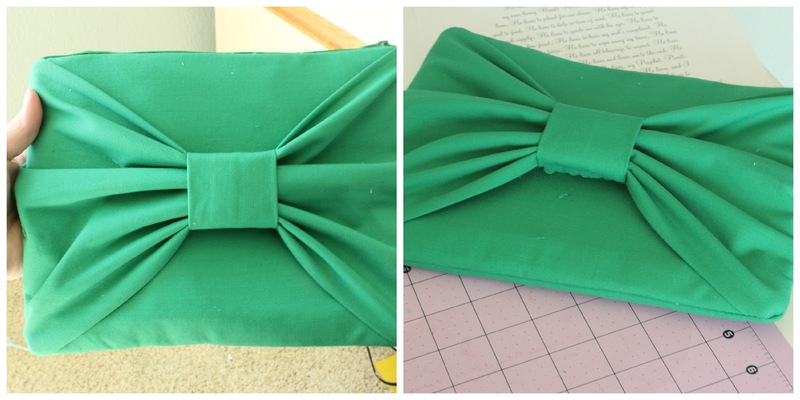 Steps 17-20: Take your zipper and center it on top of the green bow rectangle. (The first picture shows my bound zipper. I binded my zipper first but didn't really notice that it helped once I turned it right side out, so I left out those steps). Then lay your lining fabric on top to create a fabric sandwich. It should be outer fabric right side up, zipper face down, and lining fabric on top, right side down. Pin across the top, stitch using a zipper foot. Steps 21-24: Turn the lining to the inside and check that your zipper went in straight. Now build the same fabric sandwich on the other side and pin, stitch using your zipper foot. After this step, check your zipper. It should look like the 3rd picture at this point. Now take your lining pieces and match them right sides together and your outer fabric and match them right sides together. It will look like one big rectangle with your outer fabric pieces on one side and your lining on the other. Pin all the way around leaving a 6 inch opening on one side of the lining. Stitch, making sure to backstitch at your starting and stopping points. Clip your corners, making sure to not cut into your stitching line. Turn the bag right side out through your lining opening. Use a turn tool to help push the corners out. Slip stitch your lining opening closed and you are done! Enjoy your cute new clutch! i love love love that you just stick your arms through. super cute! and great tutes! I also found this tutorial via Mimi G's blog. This is super cute!! I'm making another one of these clutches and decided to cut my main bow piece at 20" by 14" and it seemed to wrok alot better, fitting. The first one I made the bow wasn't quite big enough and I had some seams showing.This time instead of zipper pockets I did simple layered pockets inside. I'm also planning on posting a tutorial soon for my fabric-zip vinyl pouches with extra pockets on the outside, check it out.